Image © Stuart Moore, June Brigman & Ahoy Comics. Main story written by Stuart Moore, art by June Brigman & Roy Richardson, colors by Veronica Gandini, letters by Richard Starkings & Jimmy Betancourt. Backup written by Tom Peyer, art by Randy Elliot, colors by Andy Troy, letters by Rob Steen. Extras by those listed above. I can’t quite decide if the main cat characters in this book are just winging it, or if they have a better idea of how to get by in their world than it seems. The Captain and his right paw, Mittens, are risking their lives in a jury-rigged ship to follow a signal they think might be from another cat ship like theirs. How this might help them is not clear. Once they’ve gone, things continue to go wrong on The Indomitable. One ray of hope comes from a message pulled from the computer archives featuring the feeder (human) who “created” them. His hologram seems willing to help. Ginger and Mittens have reached a destination, but found only more trouble. The Hashtag: Danger backup has fun exploring the personalities and resources of the three-member team, and as usual, there are several text features to read and enjoy. Good stuff. 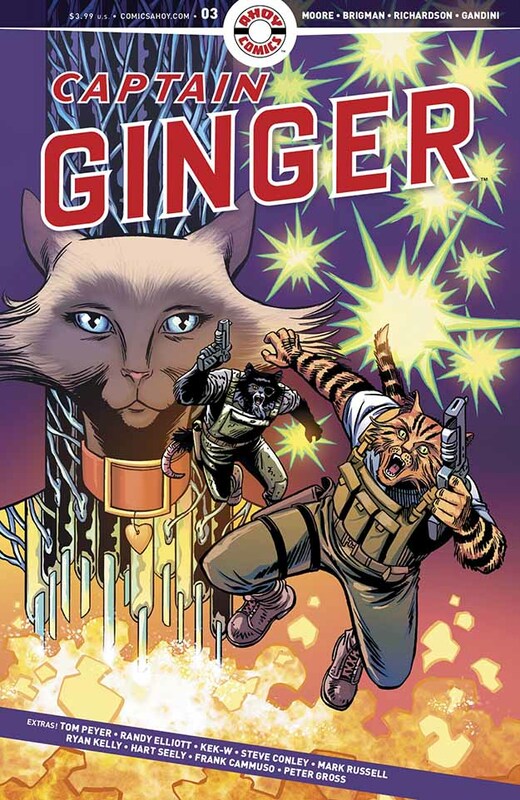 This entry was posted in Comics, Reviews on December 7, 2018 by Todd.